A pedal that goes way beyond what most compact flangers can do. TonePrint. Range of adjustment. Unusual tape setting sounds. The Vortex offers basic flanging and tape flanging emulation. There are knobs to control speed, depth, feedback and delay time. Denmark's TC Electronic is an effects legend. The last few years have seen the brand branching out into an innovative range of floor- and pedal-based products, including the genre-changing PolyTune pedal tuner and the successful Nova series stompboxes. The Novas can be quite complex in operation, however, with scrolling memories, double footswitches, 12V power and so on, so the company has now launched a new range of pedals that are very much the opposite. Here we're talking straight-up, simple stompboxes. You get a compact digital pedal that can run from a 9V battery or DC adaptor. Battery access is by removing the pedal baseplate via a large chromed knurled screw that needs a coin or screwdriver to initially loosen it. Inside, there's a pair of DIP switches - one that selects a high quality buffer rather than the default true bypass switching mode (which is useful if the pedal is at the start or end of a long chain) and a second that offersdry kill for effect only, when the pedal is to be used in an amp's FX loop. The default setting is for analogue dry through signal, where the dry part of the signal isn't converted and passes through the pedal at all times, even when the effect is active. The pedal has four knobs, plus a three-way switch, and features selectable effects variations. In designing the pedal, TC wanted something that was fast, easy and intuitive to use, with the ability to change sounds on the fly with a few knob tweaks. However, it was also aware that most stompboxes have a core sound - a basic tonality that's purely their own. Something that's fine if you like it, but that you're also unable to change if you grow tired of it. With this in mind, it set about building in a feature to allow access to a number of alternative sounds. This feature is called TonePrint: the pedal has a USB connection that allows you to import a new sound, a custom 'tuning' of the pedal, from a computer and store it in a special onboard memory slot called up by the TonePrint position of the pedal's three-way switch (or the rotary switch in the case of the delay). TC has made a number of these alternative 'tunings' available for each pedal, all easily accessed and downloaded into it from a special TonePrint website. And these aren't just voicings created by some Scandinavian boffin in a white lab coat. Instead, TC has asked a bunch of the world's best guitar players to make TonePrints for the pedals. The company has given them a specially developed tuning software that allows them to tweak every single aspect of the pedals - parameter settings, what range the pots should have, what the min-mid-max values should be, and so on, to make their own perfect pedal. Besides the TonePrint setting, the Vortex offers two types of flanging - a basic flanger and a tape flanging emulation, also known as through zero flanging. Four knobs control speed, depth, feedback and delay time. 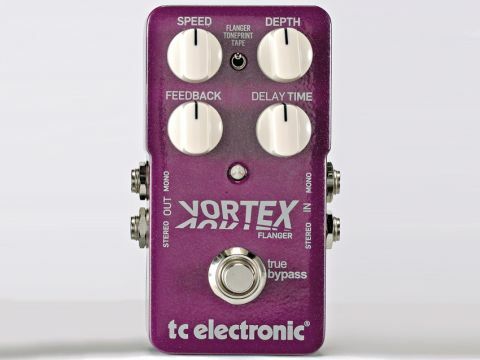 The Vortex is a versatile flanger with plenty of potential variation available from the controls. This is especially true of the feedback knob, which offers variable amounts of both negative and positive feedback. It provides a host of familiar flanging sounds in its standard mode - metallic tonalities and obvious sweeping sounds are all possible. It's the tape option, though, that's perhaps more interesting in dishing up less common sounds, especially so when phase cancellation occurs at the zero point and the sound disappears completely - something that can create strange tremolo-style effects. This is an excellent pedal, and is sensibly priced. It would be very good value even without the TonePrint feature, but it's this that really sets it apart from the herd. TC has brought something to the table that other compact pedals don't have - effectively, this pedal is updatable. The TonePrint sounds that came straight out of the box offer a useful and nicely programmed variation on the named effect but, as at the time of testing the TonePrint website wasn't live, we weren't able to try out any of the signature sounds. Nevertheless we're pretty sure that the likes of Jeff Beck and Steve Vai aren't going to put their names to something that sounds less-than-good, so we expect there will be some cool sounds coming down the road. As long as TC can keep up a constant stream of artists willing to share their sounds, you'll always have something new to try out.